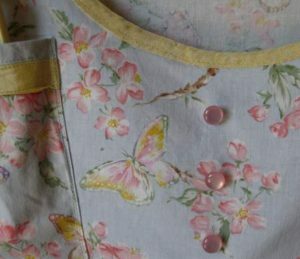 My mother, who taught me to make my first simple shirt when I was ten years old, also taught me that buttons can make or break an otherwise fine piece of clothing. 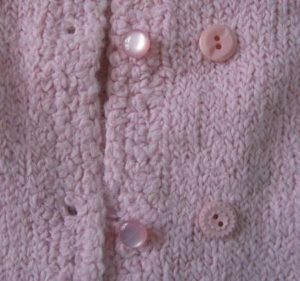 When I bought this sweater, the pearly buttons were perfect–also perfectly too small for the buttonholes. Every time I buttoned them they promptly popped out, making for a potentially embarrassing situation if I wanted to wear it as a shirt. So I went to my pink button stash and found these slightly larger vintage ones which keep my sweater dependably closed. They also look more interesting because they aren’t exactly alike. After I took the pearly buttons off, though, they cried out to add a dewy element to an otherwise airy fabric on this blue clothespin bag. Proving again that everything belongs someplace, if we can only find out where that place is.